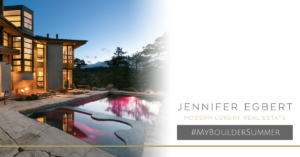 #MyBoulderSummer: What Does Luxury Mean To You? I know that Boulder, Colorado is one of the best towns in the country. We live in a beautiful area with an engaged, modern, and progressive community. Boulder is a town of wonder and experience, which is why I’m launching the #MyBoulderSummer campaign. Together with this community, my team and I want to draw attention to the everyday luxuries available in Boulder. We’ve already garnered national recognition for highlighting Boulder’s luxury real estate, and now we want to expand our repertoire to include the one-of-a-kind traits that make Boulder so unforgettable. Our guiding principle is this: What does luxury mean to you? We want to focus on all aspects of our luxurious lifestyles here in Boulder and not limit ourselves to financial luxury. Do you love our park system, the live programming available throughout the summer, our farmers market? Boulder affords us many luxuries, and we want to give space to shine a light on all of them. This summer, we will introduce you to the who’s who of Boulder as we explore all that our beautiful city has to offer. We want all of us to get to know the movers and shakers around town who are dedicated to the betterment of our community and environment. We will also explore all aspects of the Boulder, Colorado lifestyle and provide inside access to our city’s modern amenities… especially if you’re new to the area or you’ve been out of the fray for a while. Boulder is renown for its personality and quirks–expect our lifestyle to be just as dynamic and colorful. However, we can’t do this alone. Which is why we’re kicking off the #MyBoulderSummer campaign by asking our community to get involved. Tag us on Instagram, Facebook, and Twitter, and use the hashtag #MyBoulderSummer to show the world just how luxurious life in Boulder really is. As an added bonus, we want to thank you for joining this conversation. All summer long, we’re going to do random, no-contest giveaways to participants. That means all you have to do to “enter” our giveaways is post and use the hashtag #MyBoulderSummer! So – what are you waiting for? Comments Off on #MyBoulderSummer: What Does Luxury Mean To You?